Someone commented today that the unexamined life was not worth living. I strongly disagree as some of the happiest people I know are the least introspective. Yet profound satisfaction and understanding of our actions and feelings comes from examining one’s life. And so while on vacation in June, I borrowed a Ford Library Kindle and read the book, The Examined Life: How We Lose and Find Ourselves. Written by London psychoanalyst Stephen Grosz, this remarkable book tells the stories of his patients, who come to him troubled by complex emotions or their own puzzling behavior. As a practicing therapist, Grosz is trained in deep listening and attentiveness, and he uses conversations with his patients to reveal unconscious desires or masked anger. He helps his patients understand themselves so they can live a happier and more fulfilled life. As Grosz shares the stories of his patients’ lives and work, he teaches about love and loss, intimacy and separation, change and acceptance. The Examined Life is a captivating look at the hidden feelings that drive our behavior, and is recommended to anyone wanting to deepen their own sense of self or to improve their relationships with others. This brief book is an excellent choice for Labor Day holiday reading and is available on the Ford Library’s Best Sellers Kindles and in print in the book stacks. Also available as an online audiobook. UPDATED! – Ford Library will be hosting exams for Masters of Management Studies (MMS) students from 8AM – 12 Noon on Tuesday and Wednesday, August 26-27. The change (from 9am to 8am) in Library access hours has been made at the request of the faculty instructor. This means the Library will be closed during these hours (8am -noon, 8/26 & 8/27) for browsing and individual study use. The following, limited library access will be available during the above exam hours. Closed reserve textbooks and requested (on-hold) books may be picked up at the Library circulation desk. Library materials to be returned can be placed in the drop box to the right of the Library doors. Fines will not accrue for materials that are unable to be turned in during the exam hours. If you need research assistance during the above hours, please email or chat with us HERE. Access to the Library Database Room and its printers will be available. Normal access to the Library stacks and Library services will resume each day shortly after the exams have concluded. Space is at a premium here at Fuqua, and we greatly appreciate your understanding as the Library works to accommodate the academic needs of our MMS classes. If you have questions or concerns, please contact us at library@fuqua.duke.edu. Vaynerchuk, Gary. Jab, jab, jab, right hook : how to tell your story in a noisy social world. HarperBusiness 2013. The annoying title of this new book about social media marketing masks its excellent content. Author of other well-received books on branding on the internet, media consultant Gary Vaynerchuk offers his formula for developing social media content. Vaynerchuk begins by explaining that creating social media campaigns is like boxing. Strategy is key. Companies patiently build authentic relationships with their customers, one jab (conversation, engagement) at a time. Eventually, it is time to deliver a bruising swing (right hook) that will knock out customer resistance, increasing sales and market share. Beautifully illustrated, this book contains many examples from Facebook, Twitter, Pinterest, Instagram and Tumblr containing successful and failed content. For each platform, Vaynerchuk shows how to produce content that is fresh and unique, followed by 10 to 30 examples of branded posts, with both poor form and perfect execution. In each case, Vaynerchuk delivers a color commentary about what makes it good or bad, criticizing aesthetics, images, links, text, tone, timing, tagging and more as he guides the reader in the art of strategic storytelling. This engaging and informative book is recommended to those who are using new ways to communicate with customers. Ford Library and Duke University Libraries are pleased to partner with OverDrive to offer downloadable audiobooks that you can enjoy on all major computers and devices, including iPhones®, iPads®, Nooks®, Android™ phones and tablets, and Kindles®. 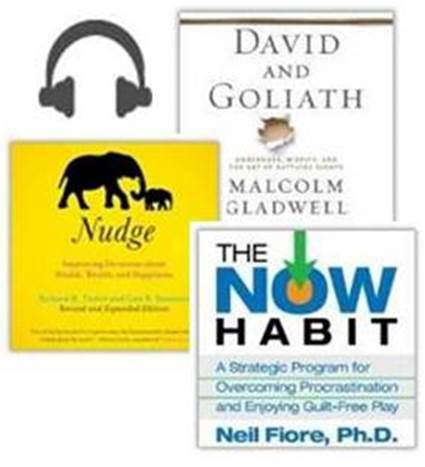 Ford Library recently added multiple copies of the most popular business audiobooks including Now Habit, Blink, Nudge, Focus, and David and Goliath. 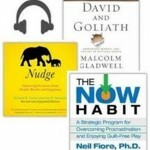 These titles and more are on our list of business audiobooks on OverDrive. To get started, click on a title link in the list document, and then click on the Get it @ Duke button. If the audiobook is available, click on the Borrow button, and enter your Duke NetID. If it is on loan, click on the Place a Hold button, and enter your Duke NetID. Audiobooks can be streamed using the free OverDrive Media Console app, which can be downloaded on all major desktop and mobile devices. To learn more about this resource, to recommend a title, or to give us feedback on the project, please visit Ford Library’s OverDrive Audiobooks webpage. In 2013 the New Yorker reported that “women in business were more likely than men to drop out of the workforce or have their careers interrupted a decade after earning their M.B.A.s, because of family considerations… Thirteen per cent of women weren’t working at all, compared to one per cent of men.” And among Harvard college graduates with professional degrees, women with M.B.A.s had the lowest labor force participation rates. To have it all – to be professionally successful and to be happy with their family life – has been a dream of professional women for 50 years. Maybe one day, women will have it all. In the meantime, three new books in the Ford Library help women to cultivate their professional potential and to create a fulfilled life. Women need to be more savvy than men in office politics so they can advance their careers in the competitive workplace. Using interviews of successful women including women of color, this book reports on workplace challenges, such as: Women must prove themselves over and over again; Women must navigate the “assertiveness” tightrope; Women are pushed aside after bearing children. Includes strategies and practical advice. Also available as an eBook. The Orange Line by Jodi Ecker Detjen et al. Author Jodi Ecker Detjen earned an MA from Duke University. She and two co-authors were high achieving professionals who faced unexpected challenges after having children. In their new book, they examine barriers in the workplace, and analyze the assumptions among career women that hold themselves back from realizing their potential. They offer practical advice for creating a life that integrates work, family and the self. Also available as a Kindle eBook. Brief profiles of 40 high-profile women working in business, technology and NGO’s are followed by their own thoughts, challenges and triumphs, designed to inspire others to live and work with courage.